Mitsubishi is displaying at the Sydney International Motor Show a hot new performance Magna with improved performance and handling gained through Ralliart's extensive motorsport experience. The "Flame Red" Ralliart Magna has more than a touch of Mitsubishi's mind-blowing Lancer Evolution VI about it, in both show and go, and is bound to please the enthusiast driver. Externally an Evo 6-style body kit gives the show car a purposeful, aggressive look, particularly as it sits on 17 x 8 Oz Racing alloy wheels shod with 225/55 performance tyres. However, it is under the skin where most changes have taken place, and they have turned the car into a real goer. The engine has been re-worked with a high-lift camshaft, sports exhaust, new head and revised engine management calibrations. The result is a delightfully tractable engine which is expected to produce approximately 180kW on premium unleaded, with it being delivered evenly across the rev range. This power is put to the ground with a revised suspension set-up (springs and dampers have been altered to give more responsive, neutral handling), while the five-speed manual variant comes with a limited slip differential as standard (the five-speed tiptronic-style automatic has Traction Control). 0-100 km/h slips by in under seven seconds, while it only takes a little over 14.5 seconds for 0-400 metres. The picks for the hot Magna are 15-inch cross-drilled discs at the front with two-pot calipers, and 10-inch cross-drilled ventilated discs at the rear. Inside the Ralliart Magna is trimmed with a red, black and silver theme. It has a special instrument cluster with red face and white markings, a premium eight-speaker Clarion audio system, Recaro seats, Momo steering wheel and gear shifter, as well as silver trim highlights in the centre console. Although the final specification has not been decided, the Ralliart Magna would retail around $50,000 in Motor Show trim. Motor racing in Australia will receive a major boost next year with the introduction of an expanded 16-meet calendar for some of the country's most important championship series. The calendar, announced by championship organising company PROCAR Australia, will see the popular Nations Cup and Australian GT Production Car Championship between them feature at every major Australian meeting, plus five stand-alone meetings, including a new event in New Zealand. The PROCAR calendar will involve around 100 drivers in four categories competing at 16 meetings on 14 different tracks between 25 February and 16 December. In addition, PROCAR categories will be accompanied at several rounds by Formula 3 single-seaters. The Audi RS4, the company's fastest wagon since the legendary RS2, has made its Australian debut at the Sydney 2000 International Motor Show. Priced at $165,000, the superbly-equipped RS4 was designed by quattro GmbH, in conjunction with Audi AG, using the Audi S4 Avant as its base. The result is the supreme model in the A4 series. The RS4 boasts a massive 280kW of power between 6,100 rpm and 6,700 rpm from a 2.7-litre biturbo V6 engine. The torque curve is equally impressive with 440Nm all the way from 2,500 rpm up to 6,000rpm. Five-valves-per-cylinder technology, 'quattro' permanent all-wheel drive, overtly sporty suspension tuning and a high-tech brake system are all combined to suit the engine's supreme performance characteristics. A total of 30 units will be available for sale to Australian customers in a one-off shipment that arrives in late-November 2000. All Australian-specification vehicles can be characterised by their distinctive Ebony-black metallic exterior with the highest quality onyx leather interior. The strikingly flared wheel arches, 18-inch standard alloy wheels, a front apron extending well down with large air inlets, an aerodynamically-styled tail and side sills harmoniously integrated into the body line all combine effortlessly to give the RS4 an aggressive presence on the road, even at a standstill. Naturally, for a sports model like the RS4, the six-speed manual gearbox has ratios chosen to suit the vehicle's character. Together with quattro permanent all-wheel drive, the transmission converts the high torque of the biturbo V6 into seemingly effortless propulsion and traction with excellent directional stability. The RS4 sprints from 0 - 100 km/h in 4.9 seconds and has an electronically governed top speed of 250 km/h. The RS4's brake system has been completely redeveloped. Much larger composite-type brake discs have been fitted at both the front and rear wheels. Large 18-inch wheels provide sufficient space for the RS4's more voluminous brake system. The 18 x 8.5 J alloy wheels with a 9-spoke design have 255/35 ZR 18 tyres. As expected, the interior of the Audi RS4 is equally as performance oriented. Recaro seats for driver and front passenger are a standard feature and provide stability, optimum lateral support and comfort. A new gear lever knob design features an eye-catching aluminium ring. The standard equipment specification of the RS4 is extensive and includes driver and passenger airbags, side airbags at the front, and Audi's SIDEGUARD head airbag system. In addition the RS4 boasts a front centre armrest, leather upholstery on the Recaro seats, and "Symphony" radio with a 170 Watt BOSE sound system available as standard. Not content with the Ralliart Magna, Mitsubishi Motors is displaying Australia's hottest sports wagon at the Sydney International Motor Show, now running at Darling Harbor. Based on the current Magna Sports sedan, the Sportswagon show car boasts a lowered sports suspension and 17x 7 ROH Adrenalin alloys shod with 235/45 Bridgestone RE711 tyres. Body styling incorporates the twin headlights and fog lights of the sedan, a body kit incorporating a new style rear deflector/spoiler, sports exhaust, and roof rails. Painted in green/purple ChromaFlair paint with silver highlights, the wagon has stunning street appeal. Inside, the car is trimmed with a leather-bound steering wheel and gear shifter, white instrument dials with red markings, and black leather interior trim. The model displayed is a five-speed 'Sports Mode' tiptronic-style sequential automatic coupled to Mitsubishi"s acclaimed Traction Control system. Mitsubishi's silky smooth 3.5 litre V6 engine received considerable attention for the Sports and VR-X models released with the TJ series in September this year. A new profile camshaft, free-flow sports exhaust and engine management calibrations lifted the power output from 147kW to 163kW, and maximum torque from 300Nm to 317Nm. 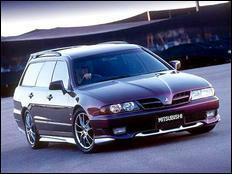 The performance gains from these modifications have received universal acclamation from Australia's motoring writers, and would make the Magna Sportswagon the hottest Australian wagon for the family person who needs the flexibility of a wagon, but also wants some real show and go. The Magna Sportswagon would retail in the high $30,000s in its Motor Show specification, and Mitsubishi is testing reaction with a view to possible production in 2001. SLK 32 AMG - 260kW! In the European spring of 2001, the SLK 32 AMG, with its 260kW AMG V6 supercharged engine, will be released. The Mercedes AMG V6 Kompressor offers very clear dynamic advantages over the familiar 3.2-litre naturally aspirated engine of the SLK 320. The use of a supercharger means that the engine output could be increased by 100kW and the maximum torque by 140Nm. The Affalterbach engineers were particularly keen to give the vehicle a dynamic torque characteristic, as a consequence of which the roadster develops its power at low revs, while also being able to move smoothly in higher gears. At 2300 rpm the engine is already able to use 400 of its 450 Newton metres. This power is passed to the rear wheels via a very sporty tuned five-speed automatic gearbox. As an alternative, the gear ratios can be changed by hand using the one-touch shift (+/-). No less innovative is the charge-air cooling system used by AMG, which features a very efficient air-water-heat exchanger system. The biggest advantage here is the compensating ability of the system to counteract temperature peaks. As a consequence, unlike conventional air-to-air systems in which, under certain thermic load conditions, the ignition angle and hence the output usually have to be corrected downwards, in the SLK 32 AMG the full spectrum of the vehicle's performance can be used at all times. Due to the vehicle's high performance, the SLK suspension has been especially adjusted for the AMG version, whose top speed is electronically regulated to 250 km/h. In addition to a new spring/damper configuration, the wider rear track width and a larger dimension torsion bar on the front axle, the good deceleration figure for the brakes (approx. 10.5 m/s2) is a particular highlight. The braking system features internally ventilated disc brakes all round (diameter at the front 334 mm, at the rear 300 mm), ABS, Brake Assist (BAS), ESP and an integrated ASR system. The sterling silver-coloured 17-inch AMG light-alloy wheels with their twin-spoke design are a completely new development. Not only do these look good, fitted as they are with size 225 tyres on the front and 245 on the rear, they also offer optimum cooling for the high-performance disc brakes. As is normally the case with vehicles in the Mercedes AMG range, the bodywork design of the SLK has been given its own, very individual design. The front and rear aprons, side skirts and an elegantly integrated airflow breakaway edge on the boot lid, which reduces the lift on the rear axle by more than 50 per cent, give the SLK 32 AMG its own characteristic appearance. The AMG styling elements are continued in the interior. Sports seats with integrated head restraints, designed especially for the roadster, ensure perfect lateral support, whilst the well-balanced ergonomics of the seats guarantee comfort on long journeys. Both seats and door panels are trimmed with two-tone leather as standard, the same material that is to be found on the AMG steering wheel and gear knob. Approximately half of the production is destined for the USA, where the Mercedes Sport division has enjoyed enduring success for quite some time now. The other units will be distributed primarily in Germany, Italy, Switzerland, Great Britain and Japan, with a handful of units making their way to Australia mid 2001. Take a Ford XR8 add a heavily modified engine and suspension, a trick paint job, unique interior and an unbelievable entertainment system and what do you get? - the XR8 Xpl?d (pronounced 'Explode') show special. The 200kW sequentially injected, 5.0 litre V8 usually reserved for the XR8 has been enhanced by a number of add-ons. The Carbon Dynamic Airbox, from Italian-based F1 supplier BMC, is made of super lightweight, heat resistant materials and increases airflow to the engine. Pacemaker 'four into two into one' headers improve both torque and fuel economy. To ensure the Xpl?d sounds as good as it looks, Remus Australia designed a unique exhaust system fitted with twin 4-inch silencers. The XR8's double wishbone front suspension and multi-link independent rear suspension have been enhanced with the addition of Koni shockers and Lovell springs. These modifications return a functional benefit, in terms of ride and handling, and strong visual cues with a low aggressive stance. Momo 18 x 7? alloy wheels and Dunlop SP Sport 9000 P245/40ZR18 tyres have been squeezed into the wheel arches. Stopping performance is second-to-none with the addition of Tickfords Premium Brake package, featuring 329mm grooved front discs and red calipers. 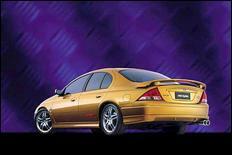 Finished in 'Firestorm' yellow, the Xpl?d will turn heads wherever it goes. In addition to the Tickford fitted body kit, the car also features bonnet scoops and carbon fibre highlights inside and out. High power "Ion Crystal" driving lights are mounted in the front bumper air intake. The lights have 20 membrane coatings (such as silicone, titanium and zircon) which are designed to project light at differing wave lengths, maximising visibility in any conditions. The leather-trimmed Recaro seats are finished in 'Charcoal Pioneer' with 'Wattle' inserts. The Xpl?d has been transformed into a 2+2 configuration with the installation of two bucket seats in the rear. All seat backs are embossed with the XR logo. The graphic good looks of the interior are completed with a carbon fibre highlight package for the dash, instrument panel and scuff plates. Six massive XSL1050G subwoofers are mounted in the boot in addition to the usual interior speakers, two XM7527 amplifiers power the 750 watt system. The dash-mounted Sony head unit uses an 'Active Black Panel'. This technology features a 5-colour dot matrix screen that pivots at the push of a button to reveal the CD slot and front panel controls. When the CD is not in use a blank panel appears, giving the impression the front panel has been removed. Opening the boot of the Xpl?d reveals a Sony DVD along with dedicated exterior speakers system. A 15-inch LCD screen mounted on the decklid provides movies on the go. On sale to the public in early December 2000, the new-look Audi A3 boasts many fresh and improved features at no additional cost. Technically, the Audi A3 1.8 Turbo and range-topping Audi S3 have new, optimised suspension settings for improved comfort and dynamic performance, an upgraded immobiliser for improved anti-theft protection and a charcoal filter added to the existing dust and pollen filter. 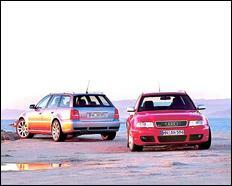 The 1.8T also gains Audi's anti-skid regulation (ASR) safety technology as a standard feature. Further highlighting Audi's commitment to modern, advanced technology, the technical innovations don't end with Audi's range-topping models. The 1.6-litre variant is now rated at 75kW at 5,600 rpm (an increase of 1kW), thanks to a new cylinder head and an optimised exhaust system with improved catalytic converter technology. Torque has also been increased to 148Nm at 3,800 rpm (up from 145Nm). The engine valves are now actuated by roller cam followers and exhaust emissions have been decreased by an impressive 20 percent. The 1.6-litre variant (manual and automatic) now complies with even stricter emission levels of EU 4 (as do 1.8 Turbo models). Overall fuel consumption has been reduced by 0.6 litres per 100km. The Ford R5 is a concept car well within the realms of possibility. The R5 is a five seat recreational utility aimed squarely at the 'let's do it' market, equally at ease in the inner city, the beach or under the starlit sky of the Australian outback. "The basic brief for the R5 was very simple," says Ford Australia President, Geoff Polites. "We wanted to create a vehicle that built upon the recreational features of the highly successful AU Falcon ute. The ability to carry five people with a host of gear would create all sorts of travel and activity options for our customers. 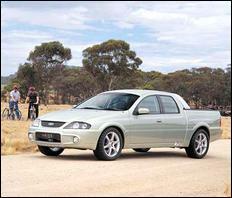 Our designers have taken the Falcon ute to another level." The R5 has an athletic yet rugged presence. Finished in subtle Ghost Gum Silver paintwork, with impressive ground clearance and large wheels and tyres, it looks ready for adventure. Based upon a Falcon ute platform, the cabin has been stretched rearward from the B-pillar with a shortened ute tub mounted behind the cabin. Entry to the cabin is via standard forward doors and unique rear opposed doors and is assisted by the deletion of the 'B-pillar'. The deeply sculptured front bumper, wheel arch flares, integrated sideskirts and 18inch wheels combine to provide a purposeful appearance. The R5 has around 75mm greater clearance than a conventional Falcon ute. The front bumper houses a simple mesh grille and high performance quad beam headlights and low-mounted driving lights. A 1-tonne electric winch has been cleverly concealed behind a mesh insert in the lower intake area of the front bumper. Twin sideport exhaust outlets are located in front of the rear wheel arches on each side of the car. An integrated sports bar is mounted on the tub behind the cabin. A canopy, lockable tonneau cover or integrated bike racks could be added easily. Attention to small items, such as the machined aluminium tie downs for the tonneau cover, has turned several functional items into design detail features. Even the tyre tread pattern has been hand finished. The 18-inch six spoke alloy wheels are shod with 245/50R18 'crossover' tyres that have a unique 'reptile' tread face, designed to deliver optimal performance on and off the road. Functional items to aid the active user have also been added. The unique rear bumper incorporates a 240v power socket and an outlet for the 50-litre on-board fresh water storage tank. The opposed doors of the R5 open to reveal a futuristic combination of form and function. The five-seats in the cabin are trimmed in contrasting Eucalypt suede with charcoal nylon mesh inserts. Brushed aluminium highlights appear on the dash, gear-shift and door trims. The central display unit (CDU) houses controls for the myriad in-car electronics which include telematics, a prestige sound system, automatic climate control, satellite navigation and mobile communications equipment such as phone, fax and e-mail access. The rear seat has a 60/40 split with access to the load area to create external load access for long items such as water skis or surfboards. The R5 is powered by a 220kW 5.0 litre V8 mated to a 5-speed manual transmission. Large four-wheel ABS discs brakes with twin-pot calipers have also been fitted, along with traction control. Mercedes-Benz Australia has introduced the impressive twelve-cylinder engine for the S-class and CL flagship coup?. The new top engine has a displacement of 5,789 cc and delivers a power output of 270kW at 5500 rpm. The max torque of 530Nm is readily available from 4250 rpm. Technical highlights of the new Mercedes-Benz twelve-cylinder engine include dual ignition, three-valve technology, automatic cylinder shut-off, low-friction cylinder liners and modern lightweight design. More compact, lighter, more economical and kinder to the environment - these are the main differences of the new twelve-cylinder unit compared with the engine previously fitted. Compared with the previous twelve-cylinder unit, mass has been reduced by about 22 per cent to 222 kilograms. This was made possible by modern construction processes and intelligent material selection. The crankcase, for example, is made of aluminium, with magnesium used for the intake manifold while the exhaust manifold is made of laser-welded, high-pressure formed sheet steel. Cylinder liners using a special aluminium-silicon alloy and connecting rods which are manufactured in the so-called cracking process provide additional weight savings of up to 46 per cent compared with the technology available for the previous V12 engine. Last but not least, the innovative three-valve technology helps shed pounds - although the main advantages of this principle are in the areas of fuel consumption and exhaust emissions.In addition, a gap between cylinders of just 90 millimetres allows for a design that is just as compact as the eight-cylinder. The cylinder angle is 60 degrees while the bore x stroke ratio is 84.0 by 87.0 millimetres. One camshaft in each of the two cylinder banks operates the valves via low-friction roller-type rocker arms. A microcomputer-controlled adjustment mechanism adapts camshaft control times to the appropriate mapping, thereby aiding torque development which is further enhanced by the complex geometry of the innovative ram pipe. Dispensing with one of the outlet valves, which in the main helps reduce heat losses inside the engine and hence speeds up the "warm-up period" for the catalytic converters from a cold start, also creates the space to introduce two spark plugs for each combustion chamber. The V12 engine is controlled by an innovative alternating current ignition system and also boasts advanced ion flow sensing used in this engine for the first time worldwide. It can instantly identify and cure any misfiring, which helps protect the catalytic converters. The V12 engine's standard cylinder shut-off system deactivates valve actuation and fuel injection for an entire cylinder bank when only part of the maximum output or torque is needed. During part-load operation this cures the inherent drawbacks of large-displacement engines; namely inadequate filling of the cylinder, low cylinder pressure and greater friction, which in turn adversely affect efficiency and hence fuel consumption. Despite cylinders being shut off automatically, Mercedes customers do not have to compromise when it comes to the remarkable performance potential and superior smoothness of their twelve-cylinder unit. Pressing the accelerator is sufficient for the deactivated combustion chambers to become fully operational, allowing the engine to deliver full pulling power again. Passengers do not even notice that cylinder shut-off is operational, because the electronic engine management system briefly alters the throttle valve position and adjusts the ignition timing to prevent any sudden jump in torque. Smoothness and low noise emissions of the V12 engine are fully maintained during cylinder shut-off. A valve in the mixing tube, downstream of the underfloor catalytic converters, closes immediately when six of the twelve cylinders are shut off to prevent higher pressure waves occurring in the exhaust system. Automatic cylinder shut-off interrupts the link between valves and camshaft hydraulically by locking the valve control arms. At the same time fuel supply and ignition on the left cylinder bank are shut off. Another technical highlight of the new V12 engine is its exhaust system: a total of six catalytic converters - four firewall catalysts plus two underfloor catalysts - and eight(!) oxygen sensors reliably ensure that exhaust gas pollutants are purified. Thanks to the low heat losses in the exhaust system - the result of three-valve technology and the air-gap insulated exhaust manifold - the firewall catalytic converters reach their operating temperature just a few seconds after the engine is started from cold. Oxygen sensors monitor emissions both upstream and downstream of the firewall converters. The data they provide are evaluated not only by the engine control unit but also by a special onboard diagnostic system. 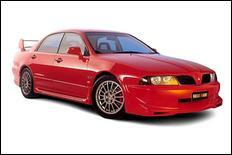 After lengthy negotiations, Classic Motoring Imports has all but signed on the bottom line to secure the Australian distribution rights for Rover and MG cars from BMW Australia and Land Rover Australia. 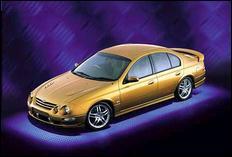 The pending deal will give the go-ahead for launch of the Rover 75. Mitsubishi Motors Australia Limited today announced its intention to form the Mitsubishi Motors Foundation that will form the cornerstone of the Company's ongoing involvement in community programs. The Mitsubishi Motors Foundation initiative will mean that the ten-year association the Company has had with the National Basketball League as naming rights sponsor will cease at the end of the 2000/2001 season. Mitsubishi Motors' cabriolet version of its highly popular Lancer coupe, being shown at the Sydney International Motor Show, is designed to test market reaction for possible future introduction. The bright red coupe's normal stylish lines, mechanicals and body kit has been enhanced with the addition of a colour-keyed cabriolet top. 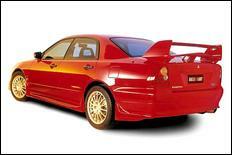 The conversion was commissioned by Mitsubishi from Advanced Vehicle Engineering in Melbourne. Ford Australia has created a range of 75th Anniversary Limited Edition models with the launch of a feature-packed Fairmont Ghia and Fairlane Ghia. The two new models join the popular 75th Anniversary Limited Edition Futura which went on sale in July. The recall scandal over hidden customer complaints is costing Mitsubishi Motors parent company so dearly that it has doubled the amount of its net losses forecast for the current financial year. One of the best value small cars available in Australia, the Kia Rio, is now even easier to own with the car maker offering its hottest selling model for $7,495 now and $7,495 in 12 months with no interest and no repayments. The Alfa Romeo 147 has won the world's most prestigious automotive award, the European Car of the Year, with no less than 51 of the 56 judges across the whole of Europe putting the Alfa 147 amongst their favourites. Morale at Chrysler is reportedly at a new low with the decision by DaimlerChrysler boss Juergen Schrempp to get rid of Chrysler's American president James Holden and replace him with a German - Dieter Zetsche, who currently heads up the group's commercial vehicle business. Ford's Premier Automotive Group (PAG) expects to sell 900,000 units this year, building over the next few years to 1.2 million units from its Lincoln, Jaguar, Volvo, Aston Martin and Land Rover brands. Nissan and Renault are forging ahead with their global restructuring, with the latest development being the return of Renault to Australia. The French cars will be sold for the first time through Nissan dealers, mirroring how Renault commercial vehicles are now being launched in South Africa through the Nissan Diesel dealer network. Getrag - the German-based company which specialises in motorsport performance transmissions - and the US based component supplier Dana are extending their alliances to research, develop, engineer, produce and market Getrag products for volume car models. The Rigoli WRX gets faster and faster - from 10.57 to 10.34 to 10.29 (as of 7:30 18/11/00) and running MPH of mid 130's indicating that they have the horsepower to run nines. What is more impressive is they now have a full interior, minus stereo! This year's Bathurst V8 Supercar classic was won by Holden drivers Garth Tander and Jason Bargwanna ahead of the Falcon of Paul Radisich and Jason Bright. And in the Bathurst GTP race an astonishing win by Holden drivers Ed Aitken and John Faulkner in their V8 Commodore HSV GTS - it crossed the finish line 7.34 sec ahead of Scott Anderson/Ross Almond (Mitsubishi Evo) after a torrid journey of almost 334km. Mazda RX7 drivers Phil Kirkham and Ric Shaw were third. The Proton Satria XLS was unveiled at the Sydney International Motor Show with a sporty GTi body kit, alloy wheels and driver's side SRS airbag boosting the car's sport and value package. Other standard features for Satria XLS include air conditioning, alloy wheels, Blaukpunkt audio system, central locking, power steering, vehicle immobiliser and body coloured exterior hardware. The new XLS model will have a retail price of $16,750. The new Honda Civic has won the 2000-2001 Japan Car of the Year award. It is the fourth win for the Civic in the award, which is chosen by a panel of 54 leading Japanese motoring journalists and industry commentators. The Civic range - comprising the Civic Sedan, Civic Hatch and the Civic-based Stream small people mover - scored 475 points, well ahead of its nearest rival, the new Lexus LS430 (325 points). 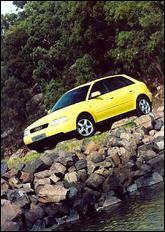 The Civic scored almost three times as many points as the third-placed Subaru Impreza (166 points).